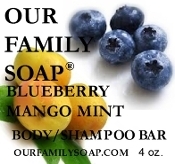 Our clasic soap with Blueberry powder and the fresh scent of Mango Mint designed for both your body and a shampoo. Leaves your skin and hair both clean and soft. Great for grey hair. Brightens with out any harsh chemicals. Another OFS one stop shopping product! A combination of olive oil, coconut oil, palm oil,, sodium hydroxid (lye, neccesary for soap making. ), natural Mango Mint FO, blueberry powder, coco butter, and Vitamin E. A generous 4 oz. bar.